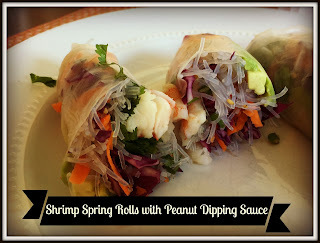 These Shrimp Spring Rolls are a great no cook option in the Summer. They take a little time to assemble, but are well worth it! Place the first 5 ingredients in a large bowl and toss. Set aside. Soften the rice paper. Place lukewarm water in a pie plate and add 2-3 sheets at a time, soaking for 30 seconds. Remove one at a time and place on a paper towel to dry, layering a towel between each sheet. Lay one sheet down and add 1/4 cup of cabbage mixture, 1 slice of avocado, 3-4 shrimp and a sprinkle of cilantro. Roll tightly, and be sure to tuck in the ends as you roll. Continue with the remaining rice paper. Be gentle as you work with the sheets, as they can be finicky. I usually have couple extra on hand. Heat all ingredients over medium heat until melted & combined. You an also add a few red pepper flakes if you want a little heat. Serve as a dipping sauce with the spring rolls.